I understand that "bokeh" refers to out-of-focus areas of an image — but there is obviously more to it than that. What does the term mean exactly? How well is bokeh really understood? Is it purely subjective, or can it be evaluated, measured, classified? And how can bokeh be compared and contrasted in different lenses? Most importantly: It's not just the disks rendered from a point source, even though that's the simplest way to describe it and see it. The disk is just a shorthand; the lens characteristics that produce these disks are always present; they're what determines the look of the out-of-focus areas in every photo you take! On the one hand, it's quite well-understood in that cause and effect are fairly well known. On the other hand, what makes one type "good" or "bad" is (as with so many things) extremely subjective and sensitive to context. The general consensus is that good bokeh renders a smooth background without artifacts, but like so many other things, it's possible to make a good picture with "bad" bokeh; it might even be a good picture because of 'bad' bokeh, like the examples with shaped apertures. Shape: The shape of the disk is determined by the shape of the aperture, and is well-described in other answers (though see also the note on 'distortion' below). In the centre is what you get from a perfectly-corrected lens (or close to it): a disk evenly lit from edge to edge – this is the situation in a large number of modern lenses. On the left is "smooth" bokeh: a bright centre with a gradual fall-off towards the edge. This is what's generally considered to be desirable, as it blends smoothly and eliminates hard edges in the background. On the right is what I call "bright-line" bokeh; a bright exterior that fades towards the centre. I'll emphasise that while you get a similar "doughnut" shape from catadioptric lenses, you can see this bright-line effect in many other lenses as well to a lesser degree. Classicaly, this is the less-desirable kind of bokeh, as it will emphasise edges in the background, sometimes to the extent of rendering them as parallel lines. Under-corrected lenses will typically exhibit smooth bokeh in the background, with the bright-edged type in the foreground. Many of the classic portrait lenses are deliberately designed this way, and it's also what's largely responsible for the very smooth "creamy" look of many older lens designs like the Zeiss Sonnar or Voigtländer Heliar. Over-corrected spherical aberration will produce the opposite; a smoother bokeh in front of the plane of focus, the harsher one behind. This is often a characteristic of lenses that are both fast and sharp, like many 50mm f/1.4 designs, as well as some macro designs (where sharpness is at a priority). While this type of bokeh might be the classically "bad" one, the effect is not usually extreme, and other characteristics of the lens can more than make up for it. Distortion: Ideally, all disks would be round and a similar shape, but various other aspects of the lens will stretch them to ovals (astigmatism, field curvature), create small tails (coma), or there may even be mechanical obstructions that cut off edges. All of these tend to be much more obvious as you move towards the edge of the frame. Color: Chromatic aberrations will colour the disk; lateral chromatic aberrations will create the familiar magenta/green fringing, and longitudinal chromatic aberration will cause a slight colour cast over the entire area of the disk, which will be a different colour in front of the plane of focus than behind. http://www.rickdenney.com/bokeh_test.htm for a very thorough test of a number of different lenses and lens designs. If you want to see an example of classically "good" bokeh, his Sonnar examples are worth checking out. http://jtra.cz/stuff/essays/bokeh/ is another good article with practical details and examples. Mike Johnson has an interesting essay about the entry of the term "boken" into English. He also links a list of ratings of various lenses [PDF] (unfortunately with only two examples). To emphasise the subjective and variable nature of things, the same Sonnar design Denney praises gets a 5/10 from Johnson (who I think is using a later Contax SLR version). The blurry background "circles" are what we normally refer to as Bokeh, however in general it more simply refers to the quality of background blur. The picture above has some truly excellent bokeh, as the circles are truly round, generally evenly shaded across the whole circle, present and visible, but not overly distracting from the foreground subject. Less desirable bokeh may show a polygonal shape, if the aperture of the lens is stopped down enough. "Good" bokeh generally only occurs at the the maximum aperture, or very nearly so. Ultimately, its up to you to decide what kind of bokeh you want in your shot. Some artists prefer that their bokeh be smooth and creamy, without any apparent circles. I personally love this effect for bird shots, as it really brings out the subject. Other artists like to take shots where the polygonal shape of point light sources in the background are part of the key subject of the shot. Bokeh comes in a wide variety, from soft edged circles, to full, solid circles, to circles with a bright ring (or two) around them, to various shapes. Fundamentally, the kind and quality of background blur in a photograph is an artistic tool, one which you can use any way that you believe benefits your shot. Not all lenses are capable of producing good-quality background bokeh. Generally speaking, a shorter depth of field allows a larger area out of focus, so wider apertures usually help, particularly for shorter focal lengths. Any macro lens worth its name will have an f/2.8 aperture at the very least. Telephoto lenses generally do not need quite as wide an aperture to create great bokeh as they compress depth better to start with. The type of aperture blades used, and the total number of them, will also affect bokeh. More blades generally produce better bokeh, however more than 8 and you get diminishing returns. Circular blades are designed in such a way that they have curved edges around their tips, which helps keep the aperture opening round at wider apertures (however as you stop down, you may still end up with polygonal shapes). 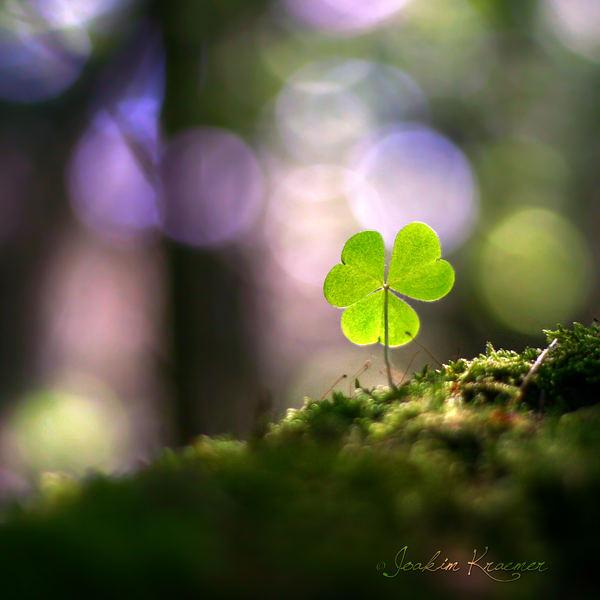 It is also possible to use non-standard apertures in artistic shapes to create interesting bokeh effects. Lensbaby offers a Creative Aperture Kit with a variety of shaped apertures. Bokeh, in its most technical definition, is the shape produced by taking an out of focus picture of a single point of light. 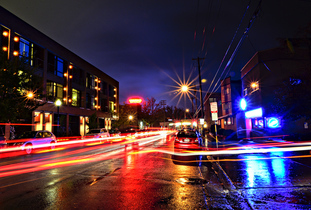 The overlapping bokeh from all the myriad points of light that make up a scene creates the blur in out-of-focus areas. People may have different preferences, but there are really just a few different measurable qualities of bokeh. Are the edges sharp or blurry? Is the disk of uniform brightness, or is it brighter in the center, or on the edges? The areas which are out of focus are blurred in a shape matching that of the lens opening. The final shape is usually circular when shooting wide open, but when stopped down, the aperture blades modify the shape, for instance, with 6 blades, the bokeh would probably be hexagonal. To really show this effect, you can use a technique to create "shaped bokeh". In doing so, you can even make the areas show as well recognized shapes, like Christmas trees or stars. 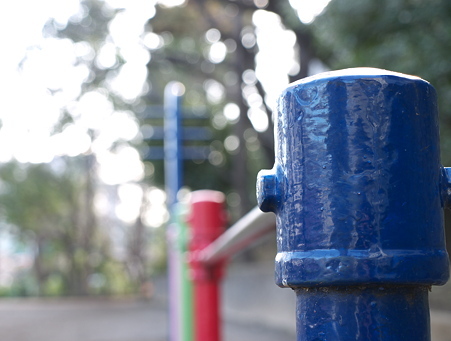 Here is one example of shaped Bokeh. Technically, Bokeh (or blur) is related to the circle of confusion of a lens/sensor combination. Bokeh is a bit like evaluating wine, there's some technical evaluation and some subjective evaluation of it. From the purely subjective, it's going to be whether or not it pleases you and the viewer, and that's a subtle thing to many. The success of the bokeh will depend on how well the subject pops from the background and whether or not you even really see the background as part of the image. However, there are some technical sides to it as well, that can be measured, to determine if the lens is even going to achieve good bokeh. Mirror lenses, for example, are often accused of having poor bokeh because of the resulting donut shape to the light, people find this distracting. For regular lenses, the ability to deliver good bokeh will depend on the quality of the lens. Out of focus light will take on the shape of the aperture, usually round and, depending on the spherical aberrations of the lens, light distribution may be uniform, to the edge, or to the center. You may also see it behave different in front of the focal plane or behind. I mentioned the shape of the aperture. In a traditional sense, the rounder the aperture, the softer the bokeh. If the aperture takes on a more hexagonal look, it can create hard edges which are seen as less pleasing. However, this feature has been put to use by photographers who shape their aperture using kits or DIY filters. Basically, you cut a small shape, say a heart, and place it in front of the lens. The bokeh will take the shape of the heart and, potentially, create an interesting effect. Mind you, it can be over done and take over the image, essentially ceasing to be bokeh. Final thing to mention is depth of field. The depth of field is influenced by both the lens and the sensor. Telephoto and macro lenses have very shallow depths of field and so typically have the greater background blur. Wide angle lenses tend to deep depths of field and so often have less blur, or even none at all at hyperfocal. For sensor, the size matters, the tiny sensors of a point and shoot will struggle to create bokeh, dSLR crop sensors can be good at, but the full frame sensors will be the best in class. Partly this is photosite density and angle of view, but it's also lenses, most point and shoots just can't open the aperture enough. Anyways, Wikipedia provides a nice description, but I summarized the technical aspects here already. Bokeh is a word we use to describe the appearance of out-of-focus blur. It comes to us from the Japanese phrase boke-aji (ボケ味), which literally means "the flavor or taste of the blur". In English, the phrase was shortened while "h" was added to aid in pronunciation. Almost all photographs have bokeh — not just images with shallow depth of field. Since lenses can only focus at one distance, all photographs of anything but flat objects have out-of-focus blur, even though with narrow apertures and small viewing sizes, it might not be very obvious. Bokeh describes the appearance and aesthetic appeal of this blur. 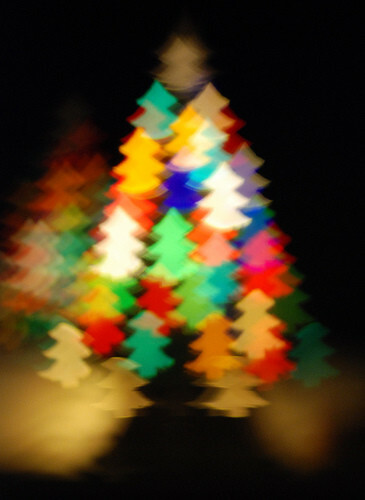 It isn't the blur itself, or the shape of out-of-focus highlights (although of course those contribute to the bokeh). Of course items like "anti-aliasing filter" have further properties as well, but the chart was getting complicated enough as is; take the ones that do have more detail as examples. Some users of the word "bokeh" actually mean all aspects of out-of-focus blur, including quality but also other things. That leads to comments like "that photo has a lot of bokeh"; this is Technically Wrong*, since strictly speaking bokeh can be more or less visible (depending on the amount of background blur) but isn't itself something that has a quantity — it just is. That argument is probably based on the translation of the Japanese word "boke" alone. 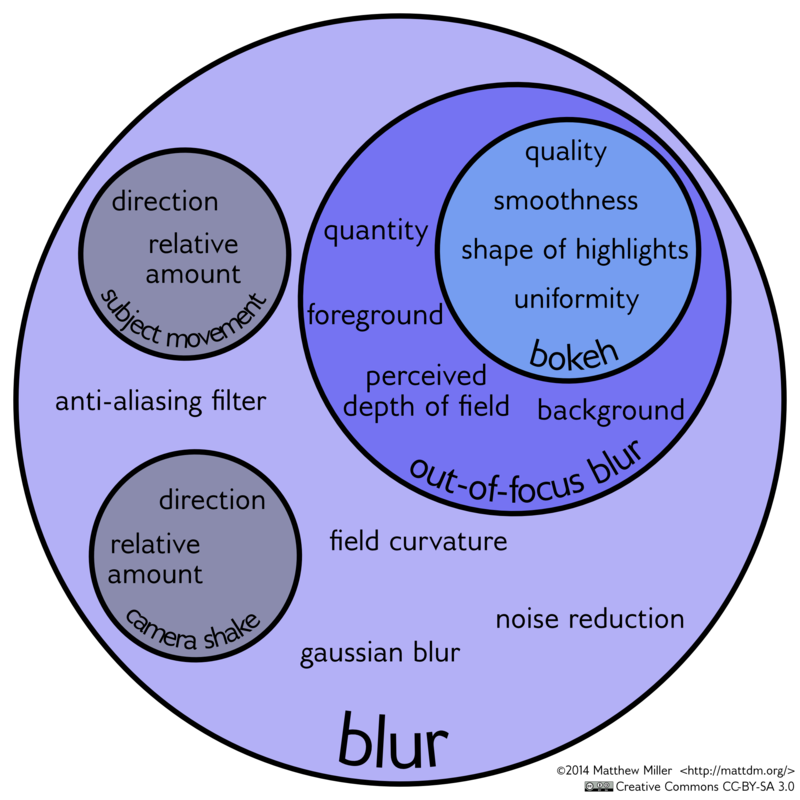 That indeed does mean just "blur" — but that ignores how the word came into English. Consider how "angst" just means "scared" in German, but has strong connotations of deep anxiety or even existential dread in English. Arguing that it should mean any fear at all in English doesn't make sense. Or, the other way around, I understand that "hardware" in German just means computer hardware, leading to amusement walking into a store selling fasteners, hammers, and cans of paint. In any case, it's probably not worth arguing with this. Instead, when communicating, be aware that some people will have different definitions in mind. On the other side of that, I have (although not recently) heard people say that bokeh should strictly be taken to mean only the quality of the foreground blur, not background blur. But I don't think that this distinction is widespread at all; I think it's safe to say that it would be a step too, uh, focused. You may also see "bokeh balls". By this, people just mean extremely out-of-focus specular highlights in the shape of the aperture — usually, round for a wide-open lens, so, "balls". Given all of the above, I think this is a poor term and would avoid it, but... it's definitely in the language of online photography discussion. Not the answer you're looking for? Browse other questions tagged terminology focus optics bokeh or ask your own question. How can I take shallow depth of field photos with a point-and-shoot camera? What is the correct pronunciation of “bokeh”? What's the difference between Bokeh and Gaussian Blur? is it possible to get “bokeh balls” using a cellphone camera? Will a dSLR and compact camera produce the same bokeh output at f/2.0? Can a photo with nothing in focus be considered to have bokeh? How does the quantity of elements and blades in a lens affect the optics? Do rounded edges on aperture blades improve image sharpness, and how? How Do DxO Lens Ratings compare between systems? Bokeh of the human eye - How does it look like & vary across apertures and individuals? What algorithm can I use to simulate bokeh? What does it mean when a TV “supports HDR”? Does focusing at infinity mean the sensor is at F?